How to schedule and archive my replies? Fan of the "Send and Archive" lab? Like to keep your inbox neat and clean? Then, ensure to enable "Schedule and Archive" in your Gmelius settings. 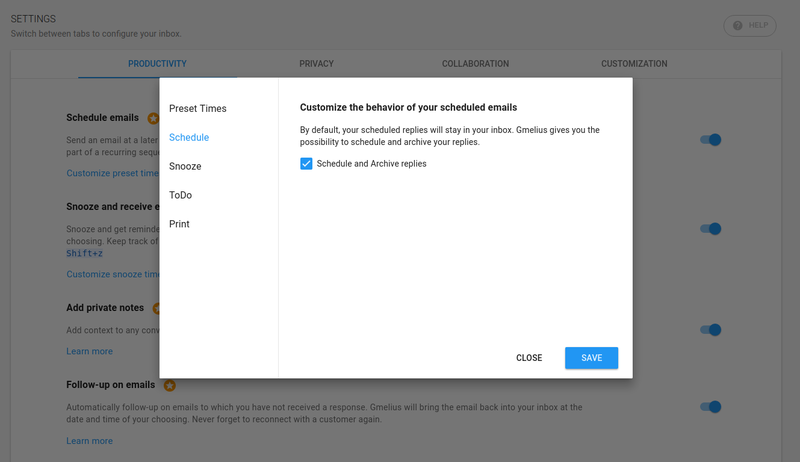 Under the PRODUCTIVITY tab, look for the "Schedule emails" entry and click on the link "Customize preset times and scheduling behavior". This will open a modal window, navigate to the "Schedule" section and check "Schedule and Archive replies". Finally, save your changes and refresh Gmail.